The Dermatologist-trusted brand for dry skin care. Eucerin® Plus Intensive Repair Foot Creme is clinically proven to help heal extremely dry, rough feet within two weeks. It combines non-irritating alpha hydroxy to smooth skin and intensive moisturizers, such as urea and glycerin. Your feet will look and feel noticeably softer and healthier. Questions? 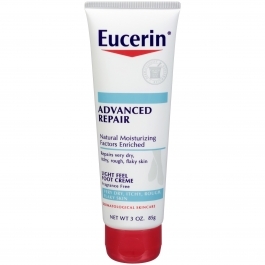 Toll Free 1-800-227-4703 or visit eucerin.com. Apply daily to feet or when needed to smooth dry, rough skin. Regular use will protect skin and prevent dry feet.